I just finished a wonderful pollinator work shop with Mike Arduser here at the Platte River Prairies. Much of this workshop involved catching bees, using a dichotomous key to identify them to genus, and then pinning the bees on-site. I am pretty pleased with my collection, and I’ve decided to share a few of the fascinating factoids that are buzzing (I am so, so sorry) around my head. 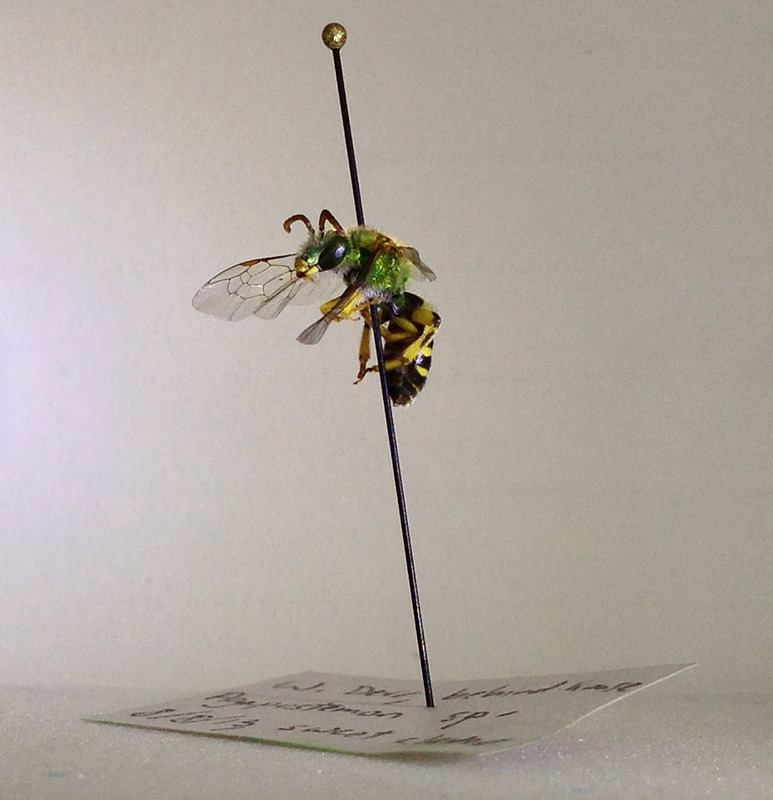 Agapostemon virescens is my new favorite bee. They are eusocial, but not tyrannically so. There is no queen, all females can reproduce; they just choose to share a nest (from “The Bee Genera of Eastern Canada”; Packer, Genaro, and Sheffield 2007). I adore these utopian bees. They also happen to be gorgeous. I’ve included a picture of the male below. The female looks similar, but is all emerald without the striped abdomen. Svastra obliqua is my second favorite bee. Their scopa (branched, pollen carrying hairs) are so exaggerated, they look like they are wearing giant fuzzy chaps. Big and easy to spot, they hang around annual sunflowers and could be confused (if you were squinting and using your peripheral vision) with a small bumblebee. The Megachile family is another good group. Instead of having scopa on their legs, they carry pollen on their abdomens. This placement requires them to rub their bellies all over a flower when they forage. It’s a pretty amusing mental picture. 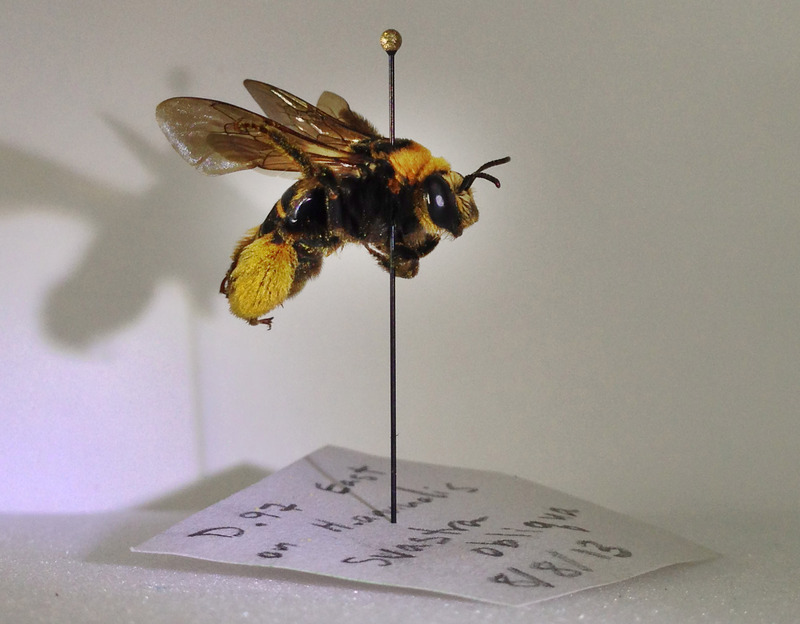 Another reason to love the Megachile is that they can be field ID’d by ear. After conferring with my fellow pollinator work shop participants, we decided that, if the bumblebee is a Harley (low pitched, rumbling “BZZZzz”, then the Megachile is the sportbike (they make a high pitched “eeeeee” sound when they forage). Once you hear their whine, you won’t forget it. Megachiles are leafcutters, and they excise circular patches from leaves to build their nests. If you see a leaf that looks like a crazed administrator took a hole-punch to it, you should start listening for the Megachile whine. 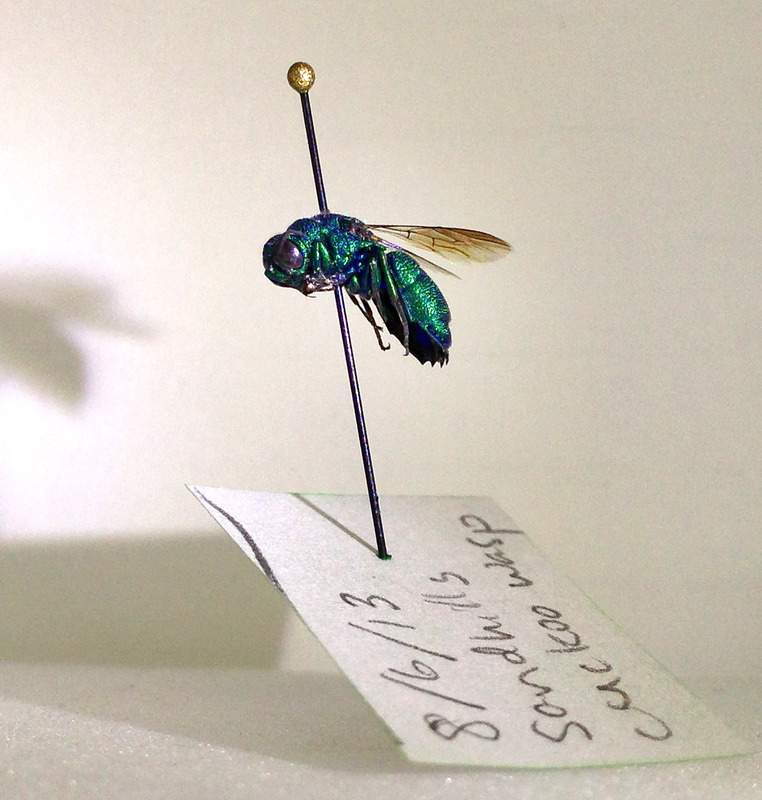 Hymenoptera bonus: the cuckoo wasp. She’s wearing a rhinestone suit of armor. There is so much more I wish to share! I foresee future posts about buzz pollination, specialists vs. generalists, combative cleptoparasites, and the potential for the hymenopteran community as an indicator of restoration success. Hymenopterans are beautiful, sometimes adorable, with unusual life histories that make their study easy to enjoy. I am so pleased I get to spend time with these creatures during my fellowship here on the Platte River Prairies. Thanks to a return visit by Mike Arduser of the Missouri Department of Conservation, it’s bee week in the Platte River Prairies. Mike came out to our sites a year ago to help us start thinking about our prairies from the perspective of bees and other pollinators. This year, he made a return visit and we’ve given him a full plate of activities. Mike Arduser (right) talks about bees with Sam Summers and Anne Stine earlier this week. On Monday, Mike and I spent the day inventorying bees at several of our prairies, assisted by Anne Stine (Hubbard Fellow) and Sam Summers (TNC volunteer). We are building upon the initial list of 57 bee species we found in 2012. Several new species have already been added to the list, and more are likely as we continue to look. We hosted a pollinator ecology workshop on Tuesday, attended by about 40 people – mostly biologists who assist private landowners with habitat projects or who manage conservation lands. 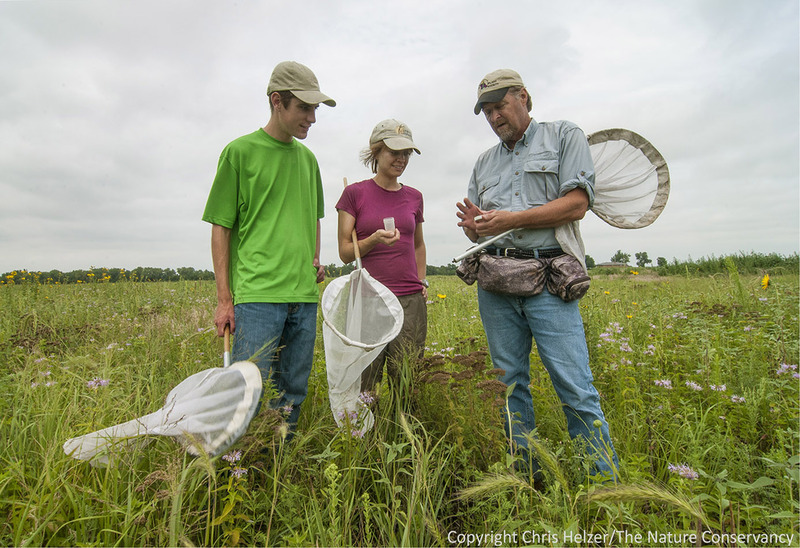 The objectives were to have Mike help us better understand basic pollination ecology and the needs of pollinator species – particularly bees, and to help us better incorporate bee habitat into our prairie restoration and management strategies. It was a great day, and everyone had their heads buzzing (sorry) with new information and ideas. At our pollinator workshop on Tuesday, we spent time talking about prairie restoration and management strategies, as well as general pollinator ecology. On Wednesday and Thursday, Mike is leading a smaller group of us through an intensive bee identification workshop. I’m looking forward to peering closely at the faces and private parts of bees through microscopes, and learning to differentiate between Melissodes, Colletes, Lasioglossums, and all the other bees in our prairies. Less than a month ago, we saw Mike at the Grassland Restoration Network workshop in Columbia, Missouri. He gave a presentation in which he talked about a variety of pollinator-related topics, including some potential ways to use bees to assess the success of prairie restoration projects. One of Mike’s suggestions was to see what percentage of bee species in a prairie are specialist pollen feeders (oligolectic bees) and compare that percentage between restored (reseeded) and remnant (unplowed) prairies. Pollen specialist bees feed only on pollen from one to a few flower species, whereas pollen generalists can feed from a wide variety of plant species. 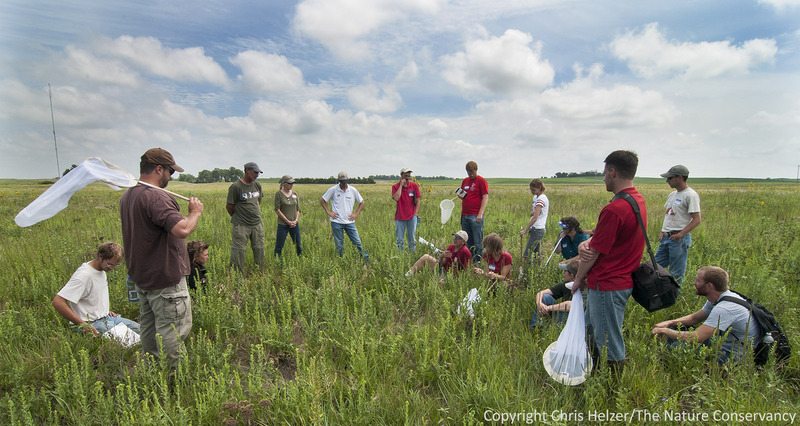 Specialists tend to be less common in small isolated prairies than in larger prairies, in part because they need a certain minimum population size of their host plants, which can be difficult to obtain in small prairies. Restored prairies might also lack that population size threshold, especially during the early establishment phase of a new seeding. In addition, restored prairies that are isolated from remnants might be missing specialist bees simply because the bees in those remnants can’t find them. According to Mike, a couple of recent surveys in Iowa found that about 20% of the bee species in remnant prairies are pollen specialists. However, some early data from re-seeded Iowa prairies is showing much lower percentages of specialist bees – especially when those sites are isolated from large remnant prairies. 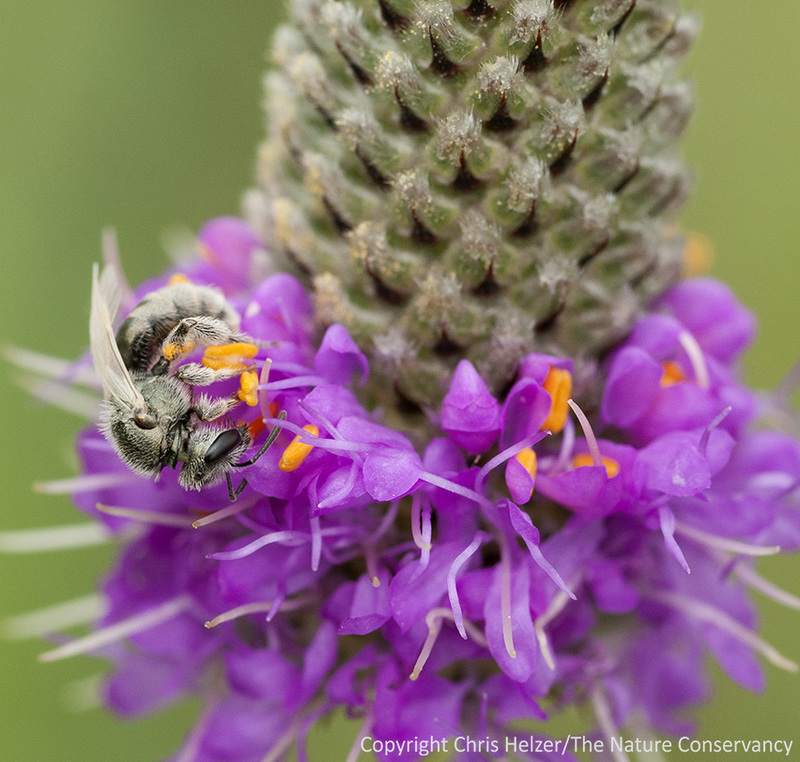 If pollen specialists are not easy to attract to restored prairies, comparing the percentage of specialist bees in restored prairies to the percentage in nearby remnant prairies might be an important way to assess restoration success. This bee is (probably – according to Mike) Lasioglossum pruinosum; a generalist pollen feeder. It’s not suprising to see it in a restored prairie. Pollen specialist bee species, however, seem to be more sensitive to habitat fragmentation, and may also be less likely to occur in restored prairies – especially if those restorations are isolated from large remnants. Mike suggested that another useful metric could be the number of cleptoparasitic bee species present in a prairie. Cleptoparasites, or cuckoo bees, are the cowbirds of bees – they lay their eggs in the nests of other bee species. Because each cleptoparasitic species tends to specialize on the nests of certain species or groups of bees, their presence could another interesting indicator of restoration success. From our 2012 bee inventory data, I can make some preliminary, and very tentative, conclusions about the number of pollen specialists and cleptoparasites in our prairies. Of the 38 species we found in remnant prairies last year, 10 (26%) are pollen specialists and only 1 (3%) is a cleptoparasite. By comparison, of the 47 bee species we found in restored prairies, 12 (26%) are pollen specialists and 7 (13%) are cleptoparasites. Those data are encouraging, but pretty sketchy because we were really just doing broad inventory work – not collecting data in a way that would allow for a good comparison. In addition, it clumps all our prairies together, so we can’t look at each one individually. Anne Stine (one of our two Hubbard Fellows) is going to help remedy that during the next couple months by conducting a short study. She do some standardized collection of bees from a variety of remnant and restored sites and then compare the percentages of specialists and cleptoparasites between those prairie types. That should give us a better feel for what’s going on. In the meantime, it looks like a relatively high percentage of the bee species in our restored prairies are pollen specialists. That probably reflects positively on both the plant species diversity in those restored prairies and the fact that they are adjacent to remnant prairies – making bee colonization pretty easy. Since the main objective of our prairie restoration work is to enlarge and reconnect our remnant prairies, those early results are very promising. …But let’s see what Anne finds before we get too excited.